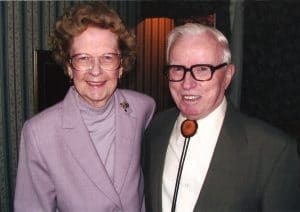 A gift of more than $1 million by a Southern Arkansas University alumna will benefit scholarships for SAU’s growing Engineering program. The generous donor, Edna Cook Norvell, recently told SAU President Dr. Trey Berry that she chose to make the gift because of all the generous people who helped her while she was a student at Magnolia A&M (now SAU). Funds from this endowment will benefit future generations of students in the form of what will be known as NORCO SAU Engineering Scholarships. Mrs. Norvell was born in Venice, Ill., and moved with her family to Buckner, Ark., in Lafayette County, in the 1930s. She attended Stamps High School before becoming a student at Magnolia A&M. She graduated from A&M in 1938; her brother, Edward J. Cook, also graduated from A&M, in 1942. Norvell embarked on a teaching career that spanned 55 years, nine states and four countries, including Japan, Libya, Germany and England. Her husband, Major Robert Norvell (USAF, Retired), was an engineer and served during World War II, Korea and Vietnam. Neither of them lost sight of their love of education. SAU Engineering, which started fall of 2014, has seen steady growth. Enrollment numbers for fall 2016 are around 200 declared majors, up from 172 in fall 2015. The popularity of SAU Engineering, the only such program in all of south Arkansas and most affordable in the state, is due to many reasons, according to Berry. Strong industry support since the program’s inception has offered students internships and job opportunities. This support has also translated into more than $400,000 in gifts and grants from industry partners to provide the program with the latest technologies and equipment so students enter the workforce with hands-on experience. With more students comes the need for more class and lab space. After the National Guard Armory building was granted back to the University in 2015, a $1.4 million renovation project turned it into a state-of-the-art engineering facility neighboring the SAU Science Center. Six labs were created along with three large classrooms, and the motor pool area is being converted to a machine shop for hands-on instruction and training. The interior of the building is expected to be named the Robert and Edna Cook Norvell Engineering Center at the Engineering Dedication on October 5. SAU Engineering offers several areas of emphasis, including Mechanical Engineering, Chemical Engineering, Engineering Technology, and a new Welding Engineering Technology program developed by the SAU System. This new program is started this fall and is one-of-a-kind in Arkansas and among only a few in the country. The Arkansas Higher Education Coordinating Board approved SAU’s addition of a Bachelor of Science in Engineering Physics with an option in Welding Engineering Technology at the Board’s April 22 meeting. This integrated program utilizes the strengths of both SAU and SAU Tech and will provide highly skilled welding supervisors for the region’s aerospace defense and oil and gas industries. As with all the academic programs at SAU, Berry said along with the focus on affordability is the importance of quality. The depth of SAU Engineering has been demonstrated by the achievements of its students. For the third consecutive year, SAU Engineering/Physics students took top titles last fall at the highly competitive annual Arkansas IDeA Network of Biomedical Research Excellence Conference. Of the 170 total presentations from universities across the region, with only a handful claiming awards, SAU students brought home three, including first in Physics Poster and second in Oral Presentation.